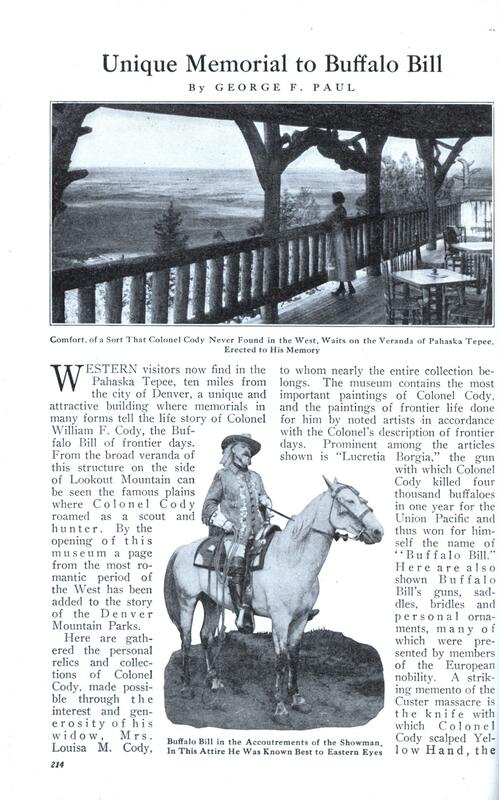 WESTERN visitors now find in the Pahaska Tepee, ten miles from the city of Denver, a unique and attractive building where memorials in many forms tell the life story of Colonel William F. Cody, the Buffalo Bill of frontier days. From the broad veranda of this structure on the side of Lookout Mountain can be seen the famous plains where Colonel Cody roamed as a scout and hunter. By the opening of this museum a page from the most romantic period of the West has been added to the story of the Denver Mountain Parks. Here are gathered the personal relics and collections of Colonel Cody, made possible through the interest and generosity of his widow, Mrs. Louisa M. Cody, to whom nearly the entire collection belongs. The museum contains the most important paintings of Colonel Cody, and the paintings of frontier life done for him by noted artists in accordance with the Colonel’s description of frontier days. Prominent among the articles shown is “Lucretia Borgia,” the gun with which Colonel Cody killed four thousand buffaloes in one year for the Union Pacific and thus won for himself the name of “Buffalo Bill.” Here are also shown Buffalo Bill’s guns, saddles, bridles and personal ornaments, many of which were presented by members of the European nobility. A striking memento of the Custer massacre is the knife with which Colonel Cody scalped Yellow Hand, the chief of the Sioux. 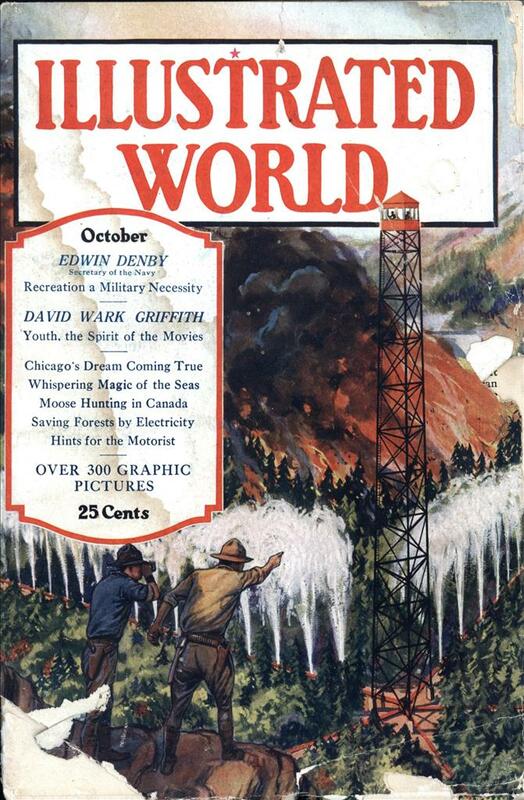 The doughty Yellow Hand’s scalp is shown. The gun used by Sitting Bull in the battle of the Big Horn, Sitting Bull’s scalp shirt and peace pipe; Short Bull’s ghost shirt—these are typical of the Indian relics shown. The name Pahaska is significant, meaning in the language of the Sioux Indians “Long Hair.” The famous scout always wore his hair long. The building itself seems to have caught the spirit of the West, and is well fitted for the purpose it serves. It is built of undressed pine logs, covered with hand-split shingles. The distinct feature of the building, architecturally speaking, is the elaborate use that is made of gnarled and curved logs and branches, stumps and roots of trees. No visitor will fail to note the remarkable chandelier that hangs from the two-story ceiling of the tepee. The wiring is buried beneath the bark, the frosted globes are held in brackets that look very much like large bird-cages, and a huge pine blister, hollowed out with tools, forms a clever inverted light. Without doubt one of the best features of the tepee is the spacious veranda which commands some magnificent views. With a pair of field glasses one may look over into the adjoining states of Kansas, Nebraska and Wyoming, favorite hunting grounds for the intrepid scout. Ten miles away as the crow flies is Denver, crawling up the hillsides. The view from the tepee has added attractions at sunset when, as the colors fade from the clouds, the lights in the distant city flash out their message of cheer and hospitality. No city lights gleamed in all this country round when Buffalo Bill roamed the mountains on horseback, to the misfortune of natives and countless bison, the latter of which are now practically extinct. The museum is built but a short distance from the great scout’s grave. It is the intention to erect here a fitting monument or memorial typical of Colonel Cody’s life work and character. The site is in keeping with the daring spirit of the man himself, and may well serve to mark the passing of the old-time western frontier. Killing four thousand buffalo no longer seems quite so admirable.